Mixed at Electric Lady Sound Studios, New York. Some copies come with a merchant add and black cardboard innersleeve with rounded corners. Steve Harris must have been watching "Knight Rider" when writing "To Tame A Land". 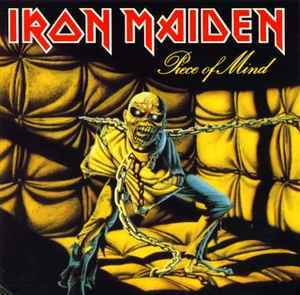 But nevertheless PoM is my fav Maiden album, I find it a marked improvement over TNoTB, the guitar/bass call and response interplay during Where Eagels Dare is just fabulous, and The Trooper IMO is Maidens signature song. And to top that Bruce joins the party by penning maybe his best track for Maiden with Revelations, and he also contributed writing Sun & Steel which got a lovely singalong course.